Your wedding day is a momentous occasion that you’ve most likely been meticulously planning since you were little. More likely than not, you probably dreamed of the perfect dress, venue, and of course, wedding cake. After all, what is a wedding without a cake? What most people don’t realize is just how much that magnificent five-tiered wedding cake is going to cost. According to a survey done by TheKnot.com, the average cost of a wedding cake in 2014 was $555. 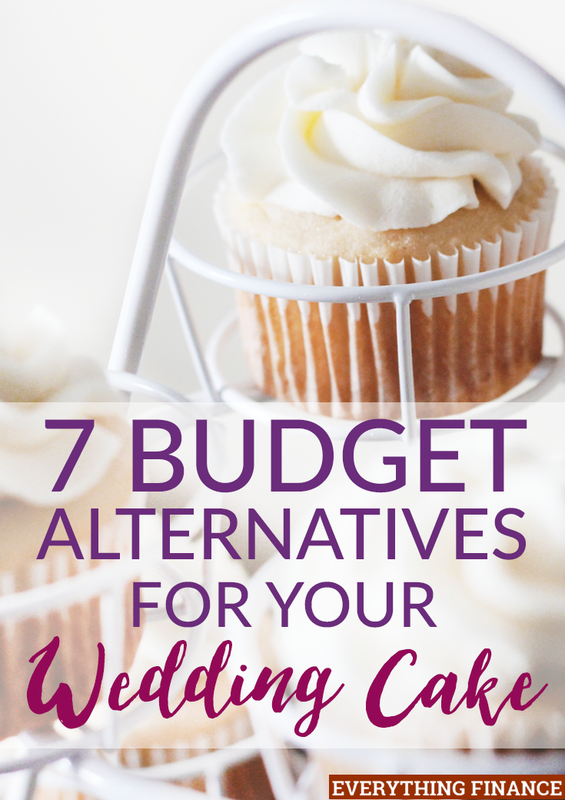 Instead of breaking your wedding day budget on cake alone, consider trying these five budget wedding cake alternatives that’ll be sure to save you money. The nice thing about this new trend is that it’s still a cake. Naked cakes tend to skip the butter cream or fondant frosting on the outside of the cake. This saves you a ton of money since you’re not getting lots of fancy extras on your wedding cake. Some of these details have to be done by hand, which can really add to the price. A naked cake also allows you to experiment with fun and unique fillings and flavors, and you can decorate with anything your heart desires – without having traditional icing to take away from those unique touches. Macaroons may be my favorite alternative to the traditional wedding cake. These delicate little cookies can make for a pretty display tower that emulates a wedding cake. They come in a wide array of colors and flavors, which you can pick and choose to your liking. To take it a step further, you can easily color coordinate these with your wedding colors. If you’re having a more rustic wedding, homemade pies can be a fitting option for your theme and your budget. Let’s face it: most people like at least one kind of pie. You could choose to have a collection of regular sized pies in assorted flavors, including some classic flavors like apple and cherry, and some modern/unique flavors, or you could opt for mini pies. Mini pies are not only adorable, like everything miniature tends to be, but they can also be displayed to look just as impressive as a cake. Plus, they allow your guests to pick and choose their favorites and possibly even try more than one flavor of pie at your wedding. Pies are also something you can DIY ahead of time if you have the will power and time to do it. They freeze well so you can make them a couple of weeks before the wedding to help you save even more money. Like the naked cake, a cupcake tower gives you a taste of the cake you may have been hoping for. Cupcakes not only appeal to picky eaters, since you can choose to have a large variety of flavors, but they also give you a great opportunity to incorporate your décor and theme into them. From the frosting and decorations, to the display stands, linens, and even the holders, you can tailor your cupcake tower to fit your wedding to a T.
Furthermore, cupcake towers can become just as much of a beautiful focal point as a wedding cake. If you’re really hoping to save, you can also suggest that the bakery use a little less of the butter cream topping than they normally do. For another fun twist that’s unique from both the traditional wedding cake and the cupcake tower, you could opt instead for cake pops. Cake pops are an even better option than cupcakes in my opinion. Because they give each guest only a bite of cake, they can take two or three different flavors to sample. This will help you appeal to the palates of more guests without spending a fortune on having multiple flavors of cake. A wedding I recently attended took a step away from these ideas by having a create-your-own-sundae ice cream bar instead. They chose to splurge on gourmet ice cream for their wedding reception, but if you are on a budget, you don’t have to. If you could have servers to dip the ice cream for guests and just allow them to top their sundaes with a variety of candies and other choices, no one will be the wiser about your budget-friendly dessert option, except the wait staff. This alternative is truly the best of every option on this list. With a dessert bar, you can include every option we listed and then some. From macaroons to cupcakes to dessert shooters, mini cheesecakes, and even chocolate covered strawberries, a dessert bar offers up an option for every taste and budget. With this alternative, you can easily control your budget with the desserts you include and the amount. You also won’t have to pay for a slicing fee like you would with a traditional wedding cake. Although dessert is a staple for most wedding celebrations these days, you don’t have to spend a fortune on a wedding cake in order to have a fabulous wedding and reception. Instead of spending hundreds of dollars on a five-tiered display of frosting and fondant, opt for a fun and tasty alternative. It’ll save your budget and leave your guests with an experience that will stand out from all the other weddings they attend. Do you have any tips to saving on your wedding dessert? What would be your favorite choice?